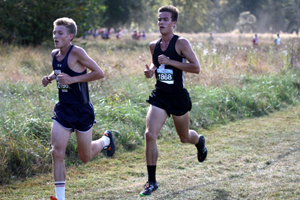 Ryan Lockett of Poolesville High School and Abigail Green of Walter Johnson High School each won the seeded races at the Glory Days Invitational in Centreville, Virginia on Saturday. It marked the first time since 2010 (Chris Miller, Northwest HS) that a Montgomery County athlete won the seeded race at Glory Days. Green is the first female winner of the meet since at least the 90's when the meet at the Bull Run Regional Park went by another name. 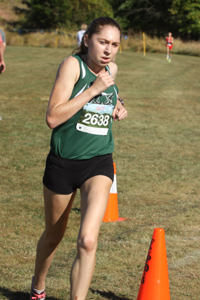 Despite intensifying her training in the two weeks between the DCXC Invitational and Glory Days, Green woke up Saturday morning and decided to give it her best effort. Said Green, "This morning I woke up. I was feeling good and so I kind of just was like, 'You know, why not give it a good shot? There is going to be some great competition here. It's a new course that I've never run before so why not just use this as a checkpoint and see where I am in my season...where I am in my training?'" She said that she was pleasantly surprised with how she felt in the first mile, but she also noticed that nobody was around her. She said that she had a moment of hesitation, but she trusted her strength and continued with her early pace, even if she did not know exactly what that pace was. She never let off the gas and she was never challenged as she won in 18:03. She looked like a returning Footlocker finalist. Lockett, too, increased his training in the weeks leading up to Glory Days. While he has his sights set on bigger races in the future, he thought that winning Glory Days was huge because he really does not have very many big cross country wins on his resume. Said Lockett, "Last year, the only two races that I won that were decently sized (not dual meets) were regionals and states. So yeah, I think this is one of my first big cross country wins and I've been training through all these races, too, so the past couple days haven't been easy for me. I felt great." Lockett had a slow start initially, but he worked his way up to the front within the first mile. He passed Severna Park's Garrison Clark somewhere around the midway point and said that he used downhills to his advantage. Clark hung onto Lockett until about the final half mile when Lockett increased his lead to seven seconds as he pressed up the winding, incline finish. His winning time was 16:05. He will compete next Saturday at the Third Battle Invitational in Winchester, Virginia before he begins championship season in Maryland. In all actuality, the Third Battle Invitational will be the toughest competition that he sees in the regular season if everyone shows up that is supposed to show up. He is excited to see how he measures up. "Next week is going to be a huge test to see how good I am cross-country-wise against top competition...I get a shot at that. I really don't know how I'm going to do, but I'm definitely going to taper for that race, and I'm going to go out there and just try to see how long I can hang on. I might burn out and I might not, so yeah, we'll see." Walter Johnson High School won the team title in the girls seeded race. 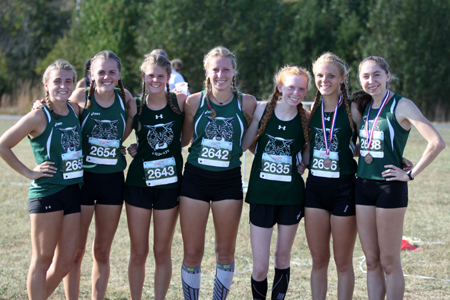 WJ received an outstanding performance from eighth place Jenna Goldberg (19:43) and seniors Janet Scott (20:38), Sophia Scobell (20:42), and Sadie Keller (21:15) finished in the top 40. With head coach Tom Martin enjoying a family vacation, assistant coach Ashley St. Denis guided the team during a long and hot day in Virginia. She said that one of the best parts about running in Virginia is the fact that her runners really don't know anybody that they are racing against. Said St. Denis, "I think they did a really good job finding each other. This is the part in the season where you gotta start doing that. Those little French braids that they do, maybe that helps, I don't know." "That's what October is all about," she continued. "September is figuring out what they can handle training-wise, and then you move into October and you're starting to work more on the team dynamic...I just wanted them to find each other today and they did a pretty good job. They were coming in in pairs." Up next for Walter Johnson is the Manhattan Invitational.